It's already that time of year again! Time to start prepping our wardrobes for fall. When I look for a jacket I always try to find a high quality classic piece that I won't have to replace every year and won't go out of style. I also like to look for pieces with layering potential because for me fall fashion is all about layers. These are some of my picks. Which one is your favorite? Great selection! I am really loving that first quilted jacket! I picked up that field jacket last weekend at J Crew Factory for $60! A huge steal! Those are all fabulous jackets!! Oh I love the first one and the fourth one! I've been dying over a Barbour jacket for this fall! I actually bought one of the pantone summer collectin (olive green), and I'll just wear a lot of layers under it to brave the cold. But I've been lusting over the #4 too! Love your taste! I can't wait for fall!! I love all of these picks!! fabulous! i learned the hard way that buying cheap jackets is never a good idea! definitely worth it to get better quality ones that will last. love the last one! Fall jackets are my favorite! I love that Jcrew one! 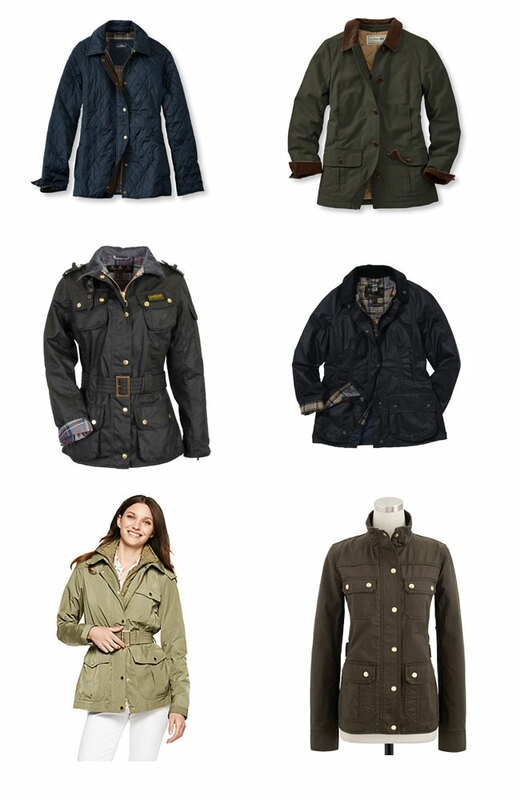 and those Barbour jackets look amazing!